Thum! Kaun Aata Hai? : A-10 Warthog as Dedicated Close Air Support (CAS) Aircraft for the IAF? A-10 Warthog as Dedicated Close Air Support (CAS) Aircraft for the IAF? My recent articles here and here on MyInd.net advocating that the IAF acquire specialized Close Air Support (CAS) aircraft like the US A-10 Warthog to better support Army operations generated some discussion on the IDP Sentinel FB Page and my twitter timeline. My case for a dedicated CAS aircraft is based on the premise that India's next war would be fought in mountainous terrain - along the LAC or LoC. The premise is based on a near consensus among leading defense analysts. 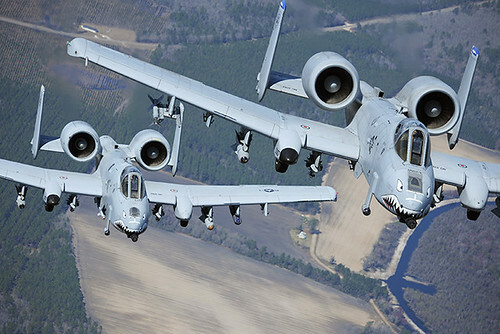 In the articles I suggested that since the USAF plans to draw down its 283 aircraft A-10 Thunderbolt II fleet to cut costs, and is contemplating overseas sale of the aircraft, the IAF could purchase some A-10s to add CAS muscle at low cost. The case for a dedicated (single role) CAS aircraft goes against IAF doctrinal thinking advocating the use of multi-role aircraft to save costs. The IAF's doctrine is based on the prevalent mindsets in the US and western nations that high performance multi-role aircraft can give effective CAS from stand-off ranges using smart weapons. Understandably, there was skepticism over A-10 purchase in some of the social media responses to my article. In this post I will address the reservations expressed as well as strengthen my case with additional facts and comments made by the GAO in its recent report questioning the USAF's A-10 draw down plans! Some readers question the ability of the A-10 Warthog to penetrate contested airspace. What they are forgetting is that the A-10 is a dedicated CAS aircraft - it will attack the enemy in proximity to friendly forces. The role doesn't involve penetrating heavily contested airspace; CAS aircraft are called in after establishing local air superiority using air defense fighter combat air patrol in combination with ground and/or airborne radar. It's high maneuverability would allow it to enter valleys and engage the enemy from close quarters after visual identification. Close quarter engagement after visual identification is essential when battle lines are fluid, as they are likely to be in the case of an incursion along the LAC or LoC. Featuring armor protection and safe engine placement, the Warthog is designed and built to absorb enemy AD gunfire. It also features SEAD capability against battlefield AD weapons. An additional point that I would like to make is that advances in EW such as SatNav jamming could degrade standoff CAS support ability of multi-role aircraft. For escorting helicopters ferrying troops and equipment to the battlefield with its firepower and SEAD capabilities. For rescue missions behind enemy lines. Against boat swarms threatening warships. During a need to operate under the weather.